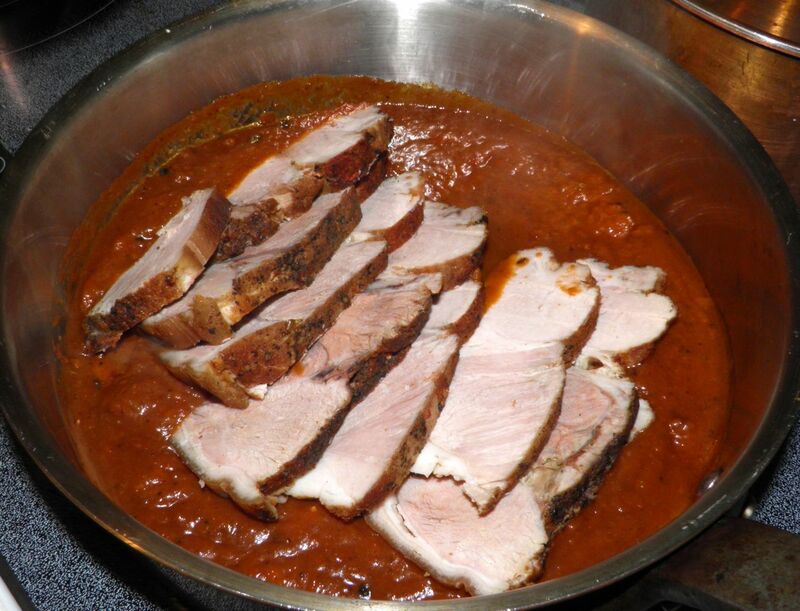 Pork roast with a delicious sauce made from the braising liquid. This is a meal that can be accomplished two ways. 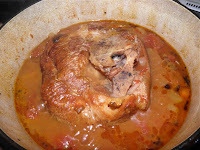 The first is to do it as outlined in the recipe, that is, serve the roast directly after it is cooked. Seal the meat by browning on all sides in the oil. I did it another way. 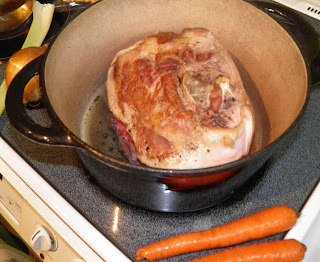 I braised the roast one evening and refrigerated the meat and braising liquid (separately). Then for dinner the next night I simply sliced the meat and reheated it in the sauce. The result? Fork tender slices of braised pork. Most of us don’t have the time to put roast on the table during the week. But we can all let a pot simmer merrily away on the stove in the evening. While it’s braising we can go about our required tasks. That makes roast available for any night of the week. 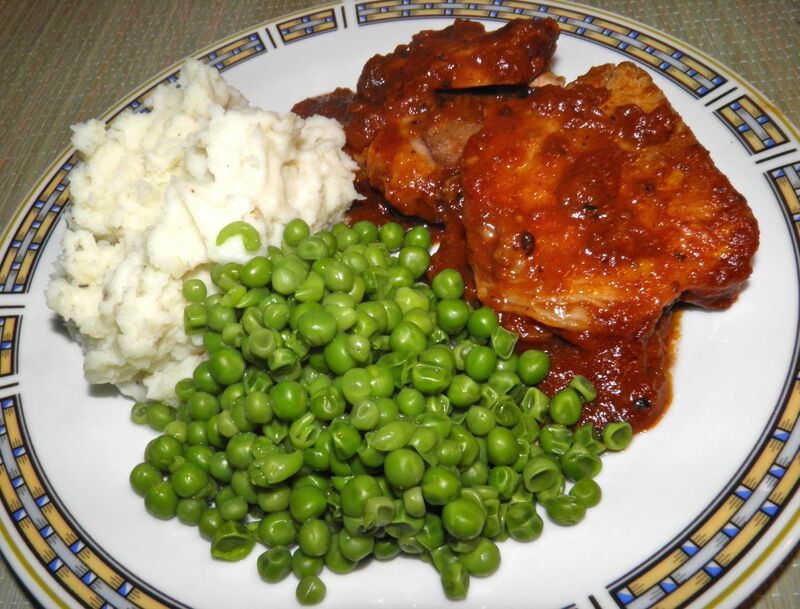 I got myself into a bit of a bind with a chunk of meat which was how this recipe came about. I had been staring at that roast in my refrigerator for nearly a week. It had to be dealt with. To make matters worse I was to go to my mother’s for Easter weekend. I’m not saying that going to my mother’s is bad, but you know what I mean. Who wants to have a perfectly good roast go to the garbage? Nestled in the braising liquid. 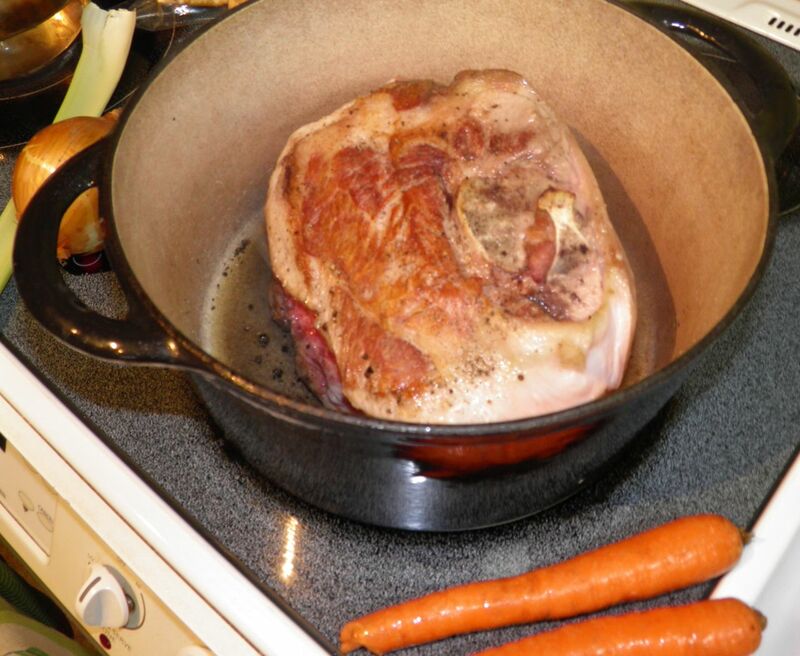 Braising or roasting meat and serving the next day is a great way to economically use your time. Both methods require little to no tending, and you then have a quick dinner ready to go. Or if your roast is large enough – dinners. The secret to good braising is to introduce as much flavour into the meat as possible. This means using aromatics like onion, carrots and celery as well as herbs and spices. I chose what I thought was a good selection of both and finished the braising liquid with tomatoes and wine. The tomatoes and wine serve another purpose as well. The acidity in both tenderizes the meat as it cooks. As a bonus all those aromatics make a wonderful sauce to serve with the meat, accentuating the flavours that have permeated the meat. Just remove the cinnamon stick, purée and reduce. The slices of pork were amazingly tender when reheated, and a benefit of refrigerating is that the roast is far easier to cut than if it had just rested and still warm. Regardless of the method you choose – same night or next – your family will have a hearty meal to enjoy. There’s a surprise second (and quick) recipe at the bottom of the post. I usually list everything in the title of my posts, but this time I didn’t. The name would have been way to long. Read on. 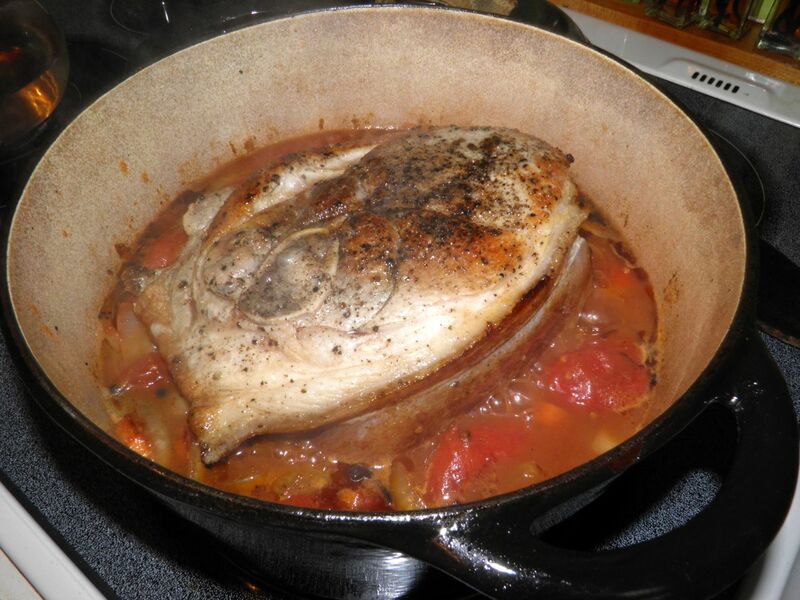 Heat the oil in a Dutch oven or other stovetop heavy pot with a lid. Season the roast with salt and pepper and brown in the oil on all sides. Remove to a dish. Chop the onions, carrots and celery and add to the oil and any slight collected fat in the pan. There shouldn't be much if any that had come out of the roast. Cook until the onions start to brown slightly. Add the spices, tomatoes and wine and bring to a boil. Add the roast back into the pan, cover and reduce the heat to simmer. Cook on top of the stove for 2-1/2 to 3 hours. Remove the roast from the pan. Remove the cinnamon stick from the pan and purée the liquid, vegetables and spices left behind. Turn the heat to medium high and cook until reduced to a thick sauce. Use your own judgement. Place the potatoes and salt in a pot with enough water to generously cover. Boil for between 12-15 minutes until they can be easily pierced with a fork. Meanwhile, heat the garlic with the butter and let simmer until very fragrant, about 2-3 minutes. Drain the potatoes and add the garlic butter, cream and pepper. Mash well until very creamy. Delicious.